Because tennis is a global sport, we made our Miss-Hits characters into an international teen gang, whose aim is to engage girls age 5-8 in tennis all over the world. First impressions of any activity are critical and many kids find tennis too dull and too difficult at the start. So we changed all that and created an environment where girls can thrive. We focussed on fun, friends and fitness and our programme makes tennis fun, stimulating and do-able. But we want to share it with many more coaches, teachers, parents, students and youth leaders so we hit the road…..or rather the skies. We’ve had a lot of success with the Miss-Hits Online course – Click Here – and now have coaches and teachers delivering the programme in 26 countries. But you can’t beat face to face contact and a practical workshop. If you do the activities, you are way more likely to remember them. Although we always give our workshop attendees video back up and downloadable notes, certificates, talking heads of the 7 characters, music and dance tutorials. Everything you need to deliver. Anyway back to the skies……we set off on 9th February, via Amsterdam to Atlanta, Georgia to run a workshop for coaches at the fabulous Atlanta Athletic Club, all set up by the PTR – Professional Tennis Registry. We then flew to Savannah and drove down to the PTR International Symposium on Hilton Head Island in South Carolina. Spreading the Miss-Hits word again with a workshop for 25 international delegates. including coaches from USA, Norway, Japan, Taiwan and Italy. We also ran a “Making tennis sociable and economical” on court session using 24 delegates. This was so much fun, ran over time and after asking the audience if they wanted more….there was a resounding YES! So important to be able to deliver Big Number activity. Keeps costs down and is way more FUN. Then we were off to Rio, and very nearly didn’t make it. We experienced our worst ever flight caused by terrible turbulence!!! Nose diving, rattling cabins, people screaming……it was like a rollercoaster at 36000 feet. Horrific. A young Brazilian coach Bruna Assemany had approached Judy about coming to Rio and presenting several different workshops, kids clinics and parents presentations at what was Bruna’s first stab at running a two day coaches conference. She did it brilliantly and was sold out at 50 coaches. We met so many enthusiastic and friendly coaches and it was great to support a young female coach in her first foray into staging an international conference. March 1st we headed to Oslo to present at the Norwegian coach conference for the 2nd year. Norwegian Tennis has just 7 full time staff and operates out of an open plan office with one meeting room, above an indoor tennis centre. But they make great things happen with a technical director and a coach development manager who are totally focussed on investing in their workforce. You could feel the sense of Team and sense of belonging in the room. So much success in the sporting world is down to the relationships you create with people. And these are people we enjoy working with. From snow-bound Oslo we hit the skies again – 3 flights and 19 hours later we arrived in sunny Palm Springs, California. Our Miss-Hits workshop was at the beautiful Lakes Country Club in Palm Desert. We trained up some of the PTR clinicians (tutors) to deliver the Miss-Hits programme to their members and formed an alliance with OnCourtOffCourt equipment supplier who are creating some wonderful Miss-Hits packs for the PTR coaches. Managed to watch some tennis at the BNP Paribas Tournament in Indian Wells, and attended the Draft Meeting for World Team Tennis, as Judy is a part of the Philadelphia Freedoms management team, together with Billie Jean King. 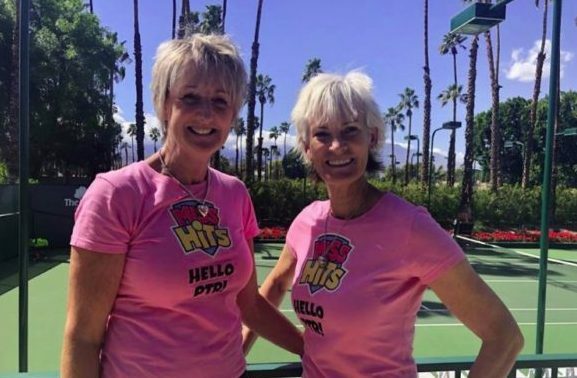 Two fantastic trips, spreading the Miss-Hits word, representing female coaches in front of some biggish audiences – while networking and sharing ideas with many coaches from lots of different venues and countries.